My logic here was that to advocate for a science- or technology-based cause–especially one as dependent on government funding as space exploration–a technical communicator needed to understand not just traditional tech comm but also marketing and politics. 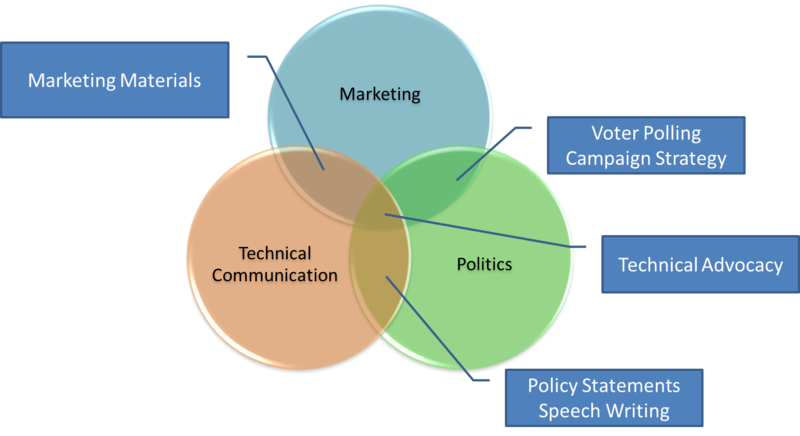 The technical communication part is pretty straightforward: tech writers supporting a technical cause must translate the technobabble into words that elected officials and the voters who elect them can understand. Politics, too, is pretty straightforward: what “angle” are you shooting for with your technology: Progress? Jobs? Improved national security? Economic growth? Public health? Politicians usually understand those, and how they could translate into votes or dollars for their district. And since we live in a representative republic, that assumes that public expenditures must have the support of the voting public. Congress and the President make the decisions–and that is where the bulk of professional advocacy goes anyway–but science or technology advocates must have answers that satisfy the voting public, not just their elected officials. Marketing? That’s sometimes a hard sell, but given the sheer amount of money that continues to pour into political campaigns no matter what reform they try, marketing is now a real and inevitable part of participatory democracy. Marketing consists of understanding the demographics, tastes, attitudes, and preferences of your target audience(s) and then developing messages/products that appeal to them. Political Aside: In the case of advocating for human space exploration, I did not choose a government-centric model because I hold any particular brief for government as the ultimate solution in expanding humanity through the solar system. However, I’m pretty certain that sending human beings beyond low-Earth orbit (Moon, Mars, asteroids, etc.) will be prohibitively expensive for private-sector companies for the foreseeable future and there’s no guaranteed return on investment for “exploration.” Ask yourself, for instance, what the ROI might have been on the Lewis & Clark expedition or Christopher Columbus’s first voyages. And like I said, I had a thesis to write. So how does one go about making oneself a professional science and technology advocate? In my case, the extra degree helped. I found myself reading a surprising amount of philosophy in grad school, anything from Aristotle to Sartre, and I continue to do so. The Greeks were the ones who codified ethos, pathos, and logos. There are also several great books of political speeches that can help the politically minded technical writer see what “works” and what doesn’t. As for marketing, that’s also a useful class or two to pick up, if only to understand how businesses or political campaigns “package” products, ideas, and people and situate them to appeal to particular audiences. If you’re interested in how the practical application of my thesis would look, see the condensed version on The Space Review. Why would a technical writer want to get into this line of work? I can speak only for myself. I learned early on that I wanted to change the world–or something like that. While others might have heard or read “I believe this nation should commit itself to achieving the goal…of landing a man on the moon and returning him safely to the Earth” or “That’s one small step for [a] man, one giant leap for mankind” and felt the urge to go into engineering, I decided I wanted to be a space writer. You might watch The China Syndrome and get the urge to become an advocate against nuclear power (or for nuclear power, depending on your inclination). Or you might find yourself involved in healthcare, nanotechnology, or some other issue that requires communicating ethically but passionately about a subject requiring technical knowledge. The point being that being a technical communicator does not always involve purely factual, objective writing. Advocacy is another way to apply your very necessary skills. This entry was posted in advocacy, marketing, science, technical writing and tagged politics, space advocacy, space exploration, technical advocacy. Bookmark the permalink.